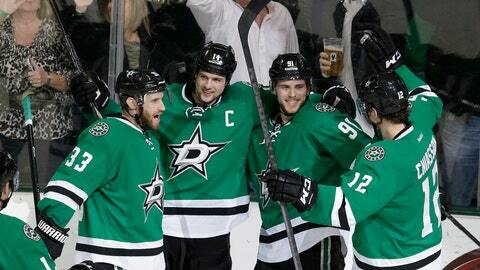 Tuesday’s Dallas Stars game at Washington at 6:00 p.m. CT will be carried on FOX Sports Southwest Plus due to overlap with other programming commitments on FOX Sports Southwest. FOX Sports Southwest Plus is a channel used by FOX Sports Southwest to simultaneously show multiple events on two channels, giving viewers another option to follow their favorite teams. Saturday, April 5 at Tampa Bay 6:00 p.m.
Tuesday, April 8 Nashville 7:30 p.m.
FOX Sports Southwest Plus is available in high-definition to all video providers that carry FOX Sports Southwest. Some providers carry FOX Sports Southwest Plus as a 24-hour full-time channel. Others choose to offer selected FOX Sports Southwest Plus programming and designate a local channel to show the events. As FOX Sports Southwest continues to expand its local programming lineup, FOX Sports Southwest Plus becomes an essential outlet to televise more regionally-relevant programming. FOX Sports Southwest Plus programming includes Major League Baseball, NBA, NHL, college football, college basketball, high school sports and other local events. If you aren’t receiving FOX Sports Southwest Plus or aren’t getting it in HD, we encourage you to contact your local video provider and request they add it to their channel lineup.